This morning I am sharing how I get some of my up close and personal bunny rabbit photos. Above is a photo to show how I have my camera set up. I have put it up on my desk with a rabbit stand in who knows how to stand still. When we first got Tigger and Shadow 10 years ago we used 35mm cameras. When digital cameras really started to drop in price, we made the switch, but found ourselves having to relearn picture-taking all over again. Taking photos of kids and rabbits is tough no matter the camera, because they rarely sit still. So we found ourselves with lots of blurred bunny photos. Getting a camera that had a kids and pets setting was a big help, but I still found myself with lots of semi-blurred images. Two things recommended to decrease blur are using a tripod and automatic timer settings to snap the picture and remove the camera movement blur that can occur when depressing the button. Using a picture snapping timer setting rarely works for bunnies because they don’t stay still long enough for even a two second timer. Normal tripods usually put me way above bunny action and I would get lots of looking down on them shots. I wanted shots to be more up close and personal. I tried just putting the camera on the floor, but that was really tough on me. I had to be flat on my stomach to see through the camera and focus. Then to get more than one shot, I had to completely rearrange myself into another position or angle if the bunnies had moved on to another place in the room. If they went to another room, I had to start over with my floor positioning. So I never got too many shots doing that. When we started to sell things online in the Rabbittude Etsy shop, we purchased several table top camera tripods to aid in product photography photos. Looking at the one I have pictured here, I realized it was a good size to put on the floor and be bunny height. It allows me to kneel and still be able to see through the LCD to focus. The swivel ability of the tripod lets me easily follow the bunnies as they move around. I can catch multiple shots staying in one location. 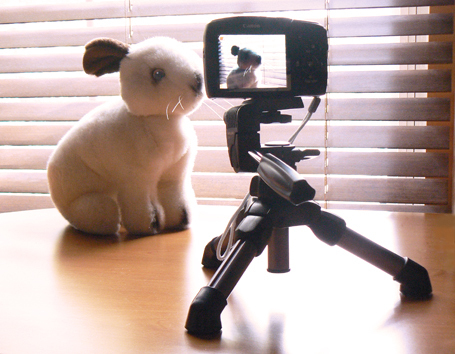 Later this afternoon, I will share some bunny shots I got using this camera setup. This entry was posted in Photos and tagged bunnies, bunny, camera, house rabbits, photo, photography, postaday2011, rabbit, rabbits, Rabbittude News & Shops, tripod by Rabbittude. Bookmark the permalink.